Musgrave Group is a retail and wholesale business with household brands including Budgens, Londis and MACE. With a £4.5bn turnover, the company employs 55,000 staff in Spain, Ireland and the UK. Staff training and development across all 650 stores relied on an outdated system and spreadsheets - unsustainable for a modern-day multinational business. Maximised efficiencies by studying current business processes and tailoring our system modules to the client's every need. This ensured that the issues of tracking learners' progress and a reduction of manual administration were directly addressed at the earliest possible stage. At the same time, this tailored approach ensured a smooth transition and a way to scale the system as Musgrave Group expands. Our flexible training management system has resulted in a 40% reduction in admin time. The client now has superior business insights and in-depth reporting. This enables management teams to focus on the challenge of planning vital business expansion. 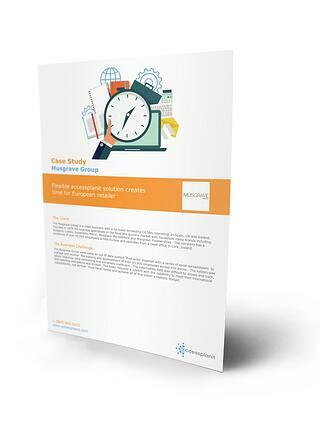 Get your free case study today, and explore how we cut admin processing time by 40% for Musgrave Group.